Well last day of April! You would think that the weather would try to be nice to us.... but not yet. It's cold outside and there are a few snowflakes still floating around. I'm hoping that is all that happens. We don't really want any staying on the ground. It's been busy around my house lately, lots of running. My siblings and I are planning a 50th anniversary party for my parents this summer. That has consumed a lot of my time lately. I finally got all the invitations made and in the mail, so now I might have a little less to do. I have been coloring lots of images now I just have to finish putting my cards together. There are lots of new great images for May coming out for Whimsy Stamps... make sure you stop by tomorrow for our monthly blog hop. You will love all the new digis. I have made this card a few days ago but never got it put up. This is a card made using a great image from Lia Stampz called Millie. I thought that I would try a different color scheme. It just turned out to be purple and yellow. The sentiment is a rubber stamp set and the corner dies are from Whimsy Stamps as well. I am really pleased with how this card turned out. I hope that you get inspired to make a card today. A closer look at the image "Millie"
Supplies: Bazzill cardstock, Graphic 45 patterned paper, Zva pearls colored with copic markers to match the paper, Birthday letter seals & corner die set from Whimsy Stamps, Offray ribbon, distress ink. 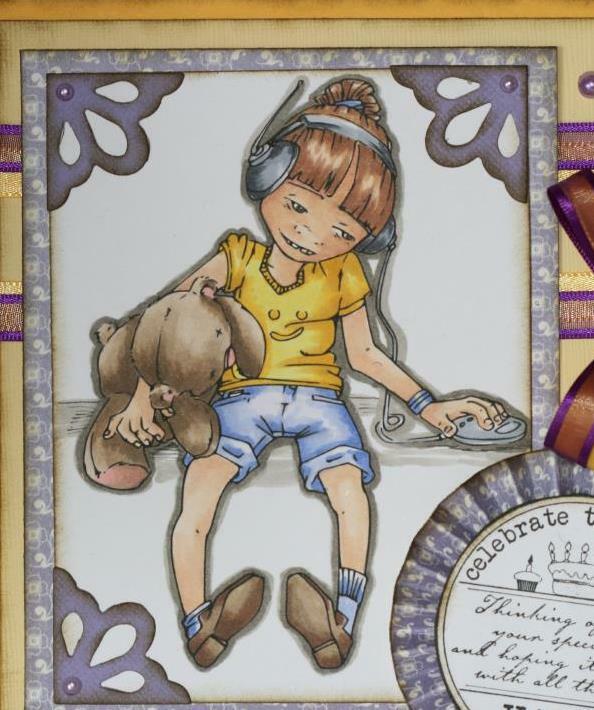 Fabulous colouring Charlene,such a cute image, love the papers and design, gorgeous card. Sweet...nice card, great to see you on here creating, sharing, inspiring us! Way to go!